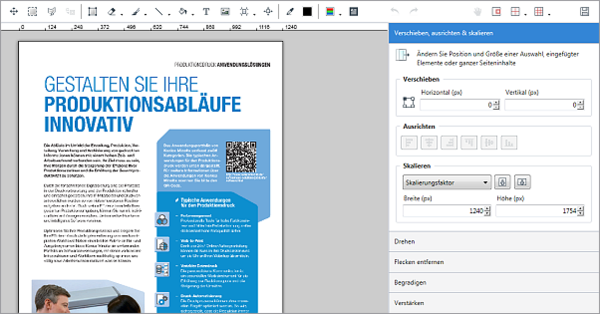 Now you can not only import documents directly into our application by using the scan function of your printing system, but you can also rectify flaws in the document resulting from scanning by using our powerful editor. The new version 6.2 of the Konica Minolta JT Suite, our software solution for production printing, now includes a TWAIN interface. This means you can scan documents by using all printing devices supported by the Konica Minolta TWAIN driver. These scanned documents are then imported directly into our application. You save yourself time-consuming detours and intermediate steps. It's in the nature of things that scanned documents don't have the same quality as digital documents. Crinkles, punch holes or dirt can lead to reduced quality. 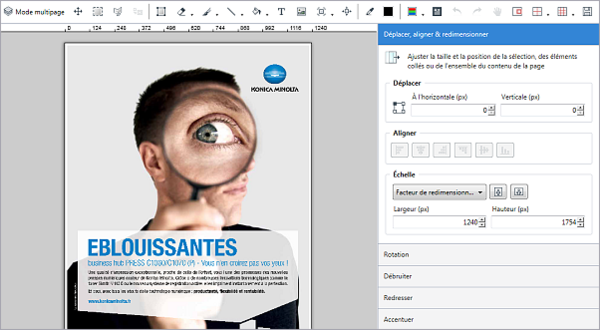 It becomes necessary to edit the documents – not only in order to improve them for purely aesthetic reasons, but also to increase the readability and to prepare them for printing. The TWAIN support, which allows the direct import of scanned documents, is included by default in the new version 6.2 of Konica Minolta JT Suite. You can purchase the JT Raster Editor as additional option. Both the update to version 6.2 and the new option are available at your local Konica Minolta partner.